In my last “Long Strange Trip” post, I looked at how Garry Trudeau wrote about Black radicalism in the early 1970s, focusing on the character of Calvin and Trudeau’s depiction of the 1971 New Haven trial of nine members of the Black Panther Party for the murder of a suspected FBI informant. When Trudeau wrote about Calvin and the Panthers, he did not bring their ideas to the comics page as much as he drew attention to the often awkward and self-serving ways in which whites engaged with, and attached themselves to, the Black liberation struggle. In effect, Calvin’s most important role was as a mirror, reflecting back white people’s racism and their inability and unwillingness to engage with Black radical ideas on terms set by African-Americans. Introducing Rufus: Doonesbury, 5 April 1971. 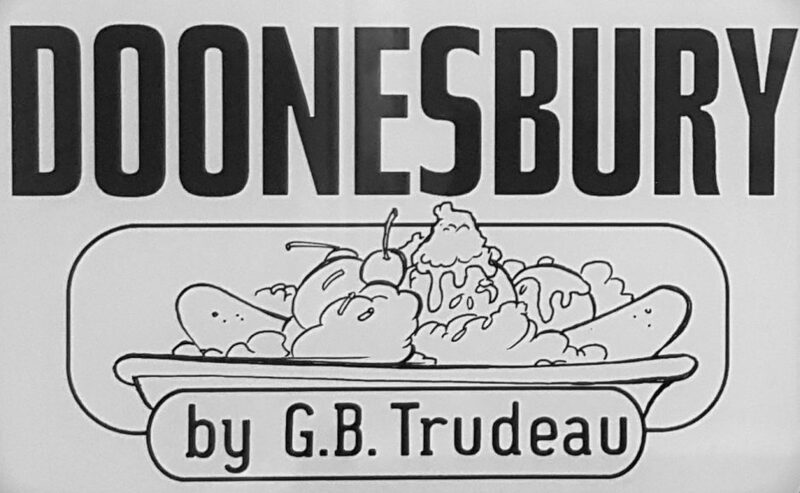 Trudeau introduced two Black characters to the Doonesbury cast in 1971. Calvin essentially disappeared from the strip after the Panther trial drew to a close. The second named Black character to appear in Doonesbury, Rufus “Thor” Jackson, is a young (his age is given in different strips as either five or eight years old) African-American boy from a ghetto (this is Rufus’s preferred term for his neighbourhood, and the one I will use here) near Walden College whom Mike tutors. Rufus was a regular presence for almost three years. While arcs featuring Calvin tended to be more strictly political, the relationship that develops between Rufus and Mike allows Trudeau to blend political satire with developing the personality of a central character. While Calvin’s appearances focused on the tensions and miscommunications between Black radical activists and well-intentioned but often clueless white progressives, Mike’s interactions with Rufus speak to a much more complex relationship. The dynamics that define Calvin’s interactions with the rest of the Doonesbury cast are still there, notably the white liberal guilt that underpins much of these interactions in the first place. On the other hand, at an individual level, Mike and Rufus develop a relationship that both characters cherish and which helps each of them grow. This is especially true for Mike, who, as he teaches and learns from Rufus, becomes much more than the loser and scapegoat he is often portrayed as. Rufus speaking truth to power. Doonesbury, 26 January 1972. In my last post, we saw how Mike’s engagement with the Black revolution is shaped by ignorance, insensitivity, and a desire for self-preservation. An arc from 1973 reminds us that Mike is the archetypical white liberal who tries to bridge the gap between himself and African-Americans, but ends up instead revealing his inability to engage with Black people without condescension. Mike appoints himself as an envoy to the Black students’ preferred cafeteria table. What begins as a naive, but arguably well-intentioned moment of outreach quickly turns awkward, leaving Mike floundering in his cluelessness and ultimately insulting the table by correcting one of the Black student’s grammar. Mike might want to do good, but he is unwilling and unable to put aside his preconceptions and listen, instead of imposing himself on a situation. A rush to fill an awkward silence. Doonesbury, 13 September 1973. Rufus gets it. Doonesbury, 12 August 1971. The spirit that drives Mike to reach out to the Black patrons of the cafeteria also lead him to take a job tutoring Rufus. A key theme in their interactions is the question of material stakes of the Black freedom struggle and the extent to which the insecurity and poverty experienced by Rufus’s family are the products of white supremacist social structures. Rufus is an early-1970s Jacob Riis, exposing readers to – or reminding them of – the conditions that exist a Zip Code or two away from them. He understands the links between racism and poverty, and tries to use that knowledge to his advantage. When the power company calls about an unpaid bill, Rufus gets that the situation reflects larger social dynamics that are in no small part determined by race. This is as true for the relationship between the Jacksons and the utility company as it is for the economy of childhood happiness. While Santa Claus may disappoint him every year, Rufus weaponizes his disappointment to inject a dose of guilt into Mike’s holiday. Beyond economic dynamics, Trudeau also uses Rufus’s experiences to reveal the broader social effects of systematic racism. A summertime postcard to Mike speaks to how urban poverty can alienate people from the natural environment; Rufus recounts seeing his “first tree” and describes it as “remarkably lifelike.” The strip’s punchline reminds readers of another social dynamic that accompanies racialized poverty, violence. While it’s unclear if the shots outside Rufus’s home are being fired by the police or other actors, Rufus’s poised attitude tells us that this isn’t the first time he’s witnessed this kind of thing (we also know that his brother has been stabbed). Merry Christmas! Doonesbury, 25 December 1971. “Things seem to be picking up.” Doonesbury, 18 July 1971. Rufus decides to capitalize on the exposition of urban poverty by offering up his services as a guide for white folks eager to experience a taste of ghetto life. In May 1972, Rufus played Virgil to Mike, Bernie, Scott and Boopsie’s Dante as they as they toured the ghetto he calls home. By now, Mike has seen enough of Rufus’s schemes to fall too hard for his schtick, but his companions are both amazed and appalled by the reality that Rufus shows them. They ooh and aah over authentic “ghetto artifacts” like an eviction notice, a nickel bag, and a canceled welfare cheque. Later, Bernie freaks out when he learns that a local “victim of the habit” will soon commit a robbery in order to feed his addiction. While Bernie is concerned for the victim of a potential impending crime, the entire group panics when their exercise in poverty tourism risks bringing them too close to the the social ills that concern them. As when he wrote about white flirtation with Black radicalism, Trudeau focuses on how white support for the anti-racist cause exists in tension with white fear of Black violence. Disaster tourism. Doonesbury 10 May 1972; 12 May 1972. Notwithstanding their fear of Black violence, Mike and his friends do believe that they are in a position to help undo racism and its effects. While GBT usually allowed white characters to embarrass themselves in their interactions with Calvin, Rufus frequently calls out white liberals for the shortcomings of their attempts to help African-Americans. While Calvin’s usual reaction to the clueless and awkward musings of his white liberal supporters is a silent grimace – after all, he cannot afford to alienate political allies – Rufus speaks truth to power in a way that only children can. Rufus’s first words to Mike – “Welcome, you dumb honky” – establish that he will not fawn over Mike’s liberal do-goodism, a sentiment he repeats after a few months of working with Mike. Beyond keeping Mike in line, Rufus offers cynical commentary on all varieties of white anti-racist activism. His limited enthusiasm for busing resonates with the attitudes of many African-American activists who saw the policy as, at best, a stop-gap measure that could not undo a long history of discriminatory educational policies. Rufus also calls out Scott Sloane for the “slightly patronizing flavour” of the food offered in the Reverend’s “free breakfast program for ghetto kids” and, when Sloane recalls hearing Martin Luther King speak at the March on Washington, expresses his doubts about the radical priest’s commitment – and that of white liberals more generally – to Black empowerment. And “empowerment” is a term that is close to Rufus’s heart. When radical visions collide. Doonesbury 1 October 1972; 13 January 1972.13 January 1972. Calvin’s politics are largely implied through his association with the Black Panthers; Rufus, on the other hand, is given more opportunity to explicitly outline his vision of Black radical politics. His focus is on the seizure of power; Rufus wants his people to have “a lasting piece of the action,” and dreams of being a nuclear physicist so that he can help his people “harness the atom” to put themselves in “a better position to bargain with the whites.” Four years before the release of Parliament-Funkadelic’s 1975 hit “Chocolate City,” in which George Clinton proposes an America led by Muhammad Ali as President, James Brown as VP and Richard Pryor as Secretary of Education, Rufus laid out his own vision of American leadership: Huey Newton as Prime Minister and Miles Davis as Attorney General (…given the times in which we live, we’re just going to skate past the Bill Cosby reference in this strip). Rufus’s radical vision. Doonesbury, 7 April 1971; 14 November 1971. While Rufus is quick to criticize white engagement with the Black struggle, he is not unflagging in his support of Black leadership. One of the few critiques of Black political activism offered by Doonesbury in the 1970s came in the form of Rufus expressing his disappointment that he could not attend an Angela Davis event because tickets were fifty dollars, “which ain’t bad bread for an avowed communist.” That said, Rufus refuses to acknowledge critiques coming from outside the Black community. Scott’s musings about how Black leaders no longer “[dream] of mobilizing their communities and shaping their own destinies,” draw nothing more than a dismissive shrug from the young Black radical. Rufus calls it as he sees it. Doonesbury 6 August 1972. And yet: while Rufus demonstrates a fair amount of disdain for the white people who attach themselves to the Black struggle, he also develops a strong connection to, and a profound gratitude for, Mike and his efforts to help him learn. Soon after they meet, Rufus awakens Mike for some late-night help with his science homework; Mike’s annoyance is quickly replaced by a genuine sense of self-worth that runs against his usual “loser” persona. A few months later, Rufus realizes that, instead of being happy for a summer break from Mike’s lessons, he actually misses the “crazy honky.” It turns out that, “for a liberal,” Mike is “pretty lovable.” In February 1973, Rufus invited Mike into his family, asking him to be the godfather for his adopted baby brother (who later turns out to be a sister named Norma Jean). When he meets Norma Jean, Mike reveals a sense of compassion that Trudeau rarely ascribes to him. He is overwhelmed by the responsibility he has taken on, and he wants to shelter Norma Jean for as long as possible from the ugly truths that will shape her life in a white supremacist society. Mike’s alright, once you get to know him. Doonesbury, 9 April 1971; 6 April 1972. In the strip’s early years, Mike is most often the scapegoat; his peers are as quick to ridicule him as he is to embarrass himself, and his conduct towards women, especially, reveals him to be selfish and insensitive. And yet, even read through the lens of GBT’s critique of white liberalism, Mike’s relationship with Rufus is an early example of the Mike’s evolution into a character who is is more aware and caring than originally presented. Writing and drawing Rufus allowed Trudeau to deliver cutting satire about the relationships between Black and white Americans at a time when those relationships were being increasingly interrogated and challenged by young people. It also allowed him to start writing his titular character as more than a loser. Mike at his best. Doonesbury, 3 March 1973. ‹ PreviousHe’s Black, He’s Beautiful, and by Gosh, He’s Angry: Race in the Early Doonesbury Strips, Part I.